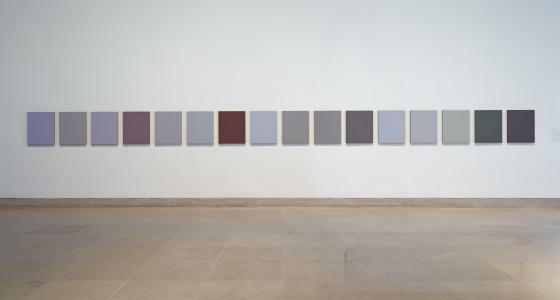 The work Monochromes after Mondrian: 1–16 comprises sixteen uniformly sized panels of mahogany, each painted a distinctly unmodulated block of color using Flashe paint. In format, it relates abstractly to Mondrian’s famous later style, in which he discarded representational painting for abstraction using only black and primary colors; however, in this group of paintings Levine references the modernist painter’s earlier body of work from 1905–1911, which often depicted murky or twilight scenes of trees, houses, wind­mills, and still bodies of water. The muted grays, browns, and purples Levine employs are typical of Mondrian’s early palette. Whether working through photographic reproduc­tion, drawing, watercolor, or sculpture, Sherrie Levine has continually defined her practice by making new versions of others’ art and placing them in new contexts. Through her process of appropriation and manipulation, Levine essentially erases the hallmark style for which modernist painters like Mondrian have historically been lauded. In doing so, she reduces Mondrian’s work to nothing more than a color palette and a name in order to question the mythology of the male artistic “genius” in modern art. Anna Katherine Brodbeck, ed., TWO X TWO X TWENTY: Two Decades Supporting Contemporary Art at the Dallas Museum of Art (Dallas: Dallas Museum of Art), 2018, 204-205. Learn more about Levine's strategies of appropriation and manipulation.